For example, a bi-directional staircase is often used to turn a corner so that steps will land on the ground in the perfect backyard spot — in the lawn or on a patio. And if your deck is elevated, well above grade-level, a contractor may build small landings into the design in order to break-up a long, continuous staircase. For even taller two-story deck designs, two sets of stairs are obligatory. Upper level stairs will turn toward the lower deck and lower level stairs will integrate into the lawn. If, on the other hand, your deck sets very low to the ground, wide deck stairs, block steps or small entry steps will often work best. And in some cases, ‘step down’ decking with zero railings can fill the bill. If a deck has a significant horizontal width, spanning the length of your home, an open center stair design can be attractive and functional. Oh… and one more thought. 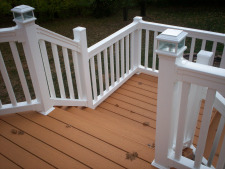 Raised deck stairs can be designed to include hidden storage behind lattice underdecking. This is a fantastic way to utilize the space underneath the stairs. 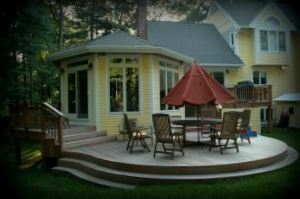 Design-wise, deck stairs and railing ‘frame’ your deck much like a beautiful picture-frame enhances the artwork inside. Stair design is important. And can be a bit tricky too. So when it comes to deck stairs, it’s usually best to leave it to the pro’s and a reputable contractor like Archadeck is sure to have plenty of practical and creative ideas. 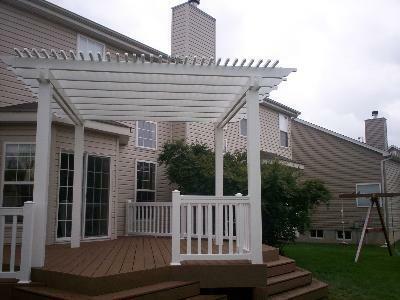 Visit our local St. Louis website Archadeck of West County and St. Charles County for more railing and staircase ideas. In the St. Louis region call 636.227.0800. If, however, you live outside of our area, visit archadeck.com to find Archadeck locations, nation-wide. 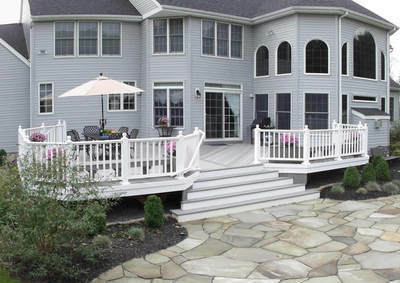 « Deck and Railing Designs: How to choose?